UBAI, the biggest online university of blockchain and investing, is launching its own ICO that will last almost for 6 months, from January 15 to June 15. TOKYO, JAPAN, January 16, 2019 /EINPresswire.com/ — UBAI, the biggest online university of blockchain and investing, is launching its own ICO that will last almost for 6 months, from January 15 to June 15. For long term holders and bonus participants: tokens will be available for purchase directly through the personal account, however, UBAI coins will be frozen for 1 year. 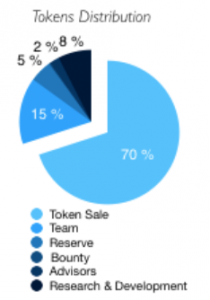 After that, on a monthly basis, 10% of tokens will be available for selling. Raised funds will be used for further development of the platform, as well as for its own blockchain, an extension of the team, and to cover the marketing and legal expenses related to the license application. The company is planning to raise $50,000,000 as for their hard cap and $1,000,000 for soft cap. The lock up period is 1 year both for company members and investors. After that, each month holders will be able to sell 10% of their UBAI coins.The overall UBAI token supply is limited to 291.600.000.000, 70% will be sold during the token sale stage, 5% will be destined to the team and project advisors. In particular, thanks to the mass adoption of the blockchain, skilled practitioners are now worth their weight in gold. More than 2000 companies all over the world are currently looking for decentralized ledger technology professionals. According to Techcrunch research, last year, freelance talent marketplace Upwork saw blockchain rise to the fastest-growing skill out of more than 5,000 skills in terms of freelancer billings — a year-over-year increase of more than 35,000 percent. These requests span ICO advisory services, engineering projects, and overall blockchain consultancy. It means that there are job opportunities not only for code writers or programmers. UBAI is an Online University of Blockchain and Investing that was founded in the beginning of 2018 by a group of professionals from different fields that have direct or indirect relevance to blockchain industry. Meanwhile authors of the UBAI courses are the leading specialists in legal and financial planning, blockchain programming and other technical topics. In the meantime of the course creation, the blockchain industry has suffered important changes, such as employment of new mechanisms, layers, hard forks, and even the approval of regulations. Authors of UBAI courses continue working on adding complementary material in order to keep up their students on the latest updates and news. Thus, one should understand that he or she is investing in already existing product that will be in demand for years. With UBAI courses people of all ages and from all social sectors will be able to change their professions or working positions for something more valuable and better rewarding. UBAI team has opted for diversification – its platform will include not only online courses or news portal, but also a blockchain based diploma confirmation system, career development center together with the finance department that will deal with ICOs and STOs analysis. The idea of academic certificates on the blockchain is based on the fact that blockchain can serve as a decentralized permanent unalterable storage of all type of information or even assets. It is erroneous to think that blockchain is all about currency or payment system. UBAI’s diploma confirmation system will help educational institutions to build a secure and immutable database of the graduate certificates, thus helping ex-alumni to pursue successful careers. At the same time, companies will be protected from possible frauds. By the way, career records, achievements and any other valuable documentation may also be safely stored, and easily verified in any part of the world. UBAI is one of the few universities that has its own career development center. One thing is to offer education, and another thing is to put it on practice. Even in blockchain industry, it may cost time to find a position where one can apply recently acquired knowledge. UBAI has a list of partners and companies that are constantly looking for new employees or interns. Another feature – is their analytical department. Currently, many inexperienced investors participate in ICOs without previously verifying them. Traders base the decision on a couple of articles and comments on Reddit or Twitter. As a result, people get fooled/scammed by commercials with superstars, like was the case with Mayweather. UBAI, in turn, studies not only the viability of the idea that ICO conducting company is trying to achieve but also its team experience and the existence of required skills to develop a decent product. For that purpose, UBAI employs both top-down and bottom-up methods of analysis. Additionally, UBAI team is working on a platform that would allow its users to assist to different conferences without having to travel thousands of miles. Thanks to VR technology it will be possible to become a part of the meeting and even interact with the surroundings remotely. VR technology will be also used in the education process, as a result, a virtual university will be created.